October is Health Literacy Month, which promotes the importance of individuals understanding information about their health. According to the National Assessment of Adult Literacy, nearly 90% of adults lack the health literacy skills needed to manage and prevent disease. Additionally, studies have found that limited health literacy skills correlate with poor health outcomes, including higher hospitalization rates and less frequent use of preventative measures. With more than 70% of medical decisions based on laboratory testing*, laboratory results are valuable insights into an individual’s health. Online laboratory results from an applicant’s life insurance application provide a unique opportunity for individuals to learn more about their health. ExamOne’s online laboratory results**, Inside Look®, makes it easy for applicants to view and understand their laboratory test results. 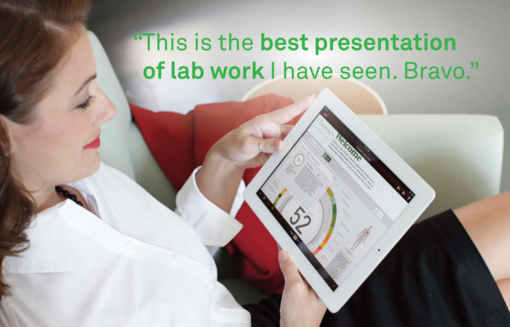 Watch a demo of the patented ocular view of our online laboratory results. Unknown health conditions may also be revealed. For example, the American Diabetes Association says there are more than 7 million Americans who are undiagnosed diabetics. Elevated A1c levels revealed from laboratory testing could alert an individual to visit their physician to determine if more targeted care is needed. Inside Look is a secure and comprehensive reporting tool that enables applicants to become more aware of their health, while providing life insurance agents and carriers the opportunity to strengthen relations with their clients. The interactive and “no cost” experience is a valuable benefit to completing the life insurance exam process. Applicants repeatedly share their positive reviews of receiving their personal health information. Health Literacy Month is a good opportunity to promote the value of an individual’s health data. While protecting their family with life insurance, they are also empowered to maintain or improve their health by receiving an “inside look” into their current health status. **Online results are for blood and urine specimens only, and availability is subject to carrier participation. Reports with sensitive results, such as positive HIV or drugs of abuse, are not provided online. Cotinine positivity: Has it increased or decreased in the past 12 years?